Brian and Joe bring you Kansas City historical moments for your listening pleasure! click the pic to listen! It’s October! Joe and Brian share Halloween decoration progress. Local veterans are helping out their own who are in need of homes. A couples love for KC turns into a double decker bus tour of the Fountain City, Bottles of KC Bier Company beer is now available at the liquor stores. Nordic food? You bet and KC has a place to enjoy it. Plus spooky and fall outing recommendations. Local music from Fullbloods and the Damien Gunn Band. Come here your latest moments in KC history with Joe and Brian! Bryce Veazey and Brandon Woodall from The Invisible World stop by to talk with Joe and Brian about their current album “Color/Echo” and how the band got started. Hear tracks “Color’Echo” and “Ought to know”. The Invisible World @ The Tank Room! 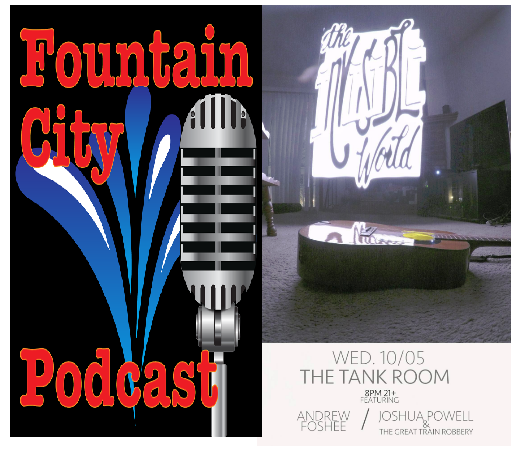 Also catch up with Fountain City Podcast Episode 23! click the links or the pic below to get there!